Knowing how to clean car carpet stains will keep your vehicle looking great for a long time. 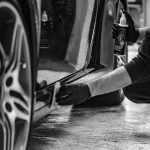 The cleanliness of a car’s interior is often second fiddle to maintaining the car paint glossy or doing the engine bay cleaning to set it free from grime. Before you know it, your carpet is splattered with coffee stains from “to go” espressos, chocolate marks from leftover Milky Ways, a touch of red from a fallen lipstick, and some mud stains whenever it rains. Cleaning stains from your car carpet is simple, but it does take some work. However, having a clean interior is worth the effort. 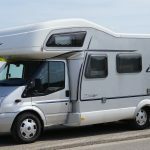 Park your car in an area with enough space to fully open all doors with some moving space to spare. It would be best to park outdoors where there is enough sunlight. Open all doors, look around the car’s flooring and start gathering items like candy wrappers, small pebbles, food scraps, bottle caps, pen, paper, and any debris that litter the floor. If you have floor mats, remove those and set aside for separate cleaning. Look under the seats and the corners, clear out everything that you can get your hands on. Vacuuming a car the right way is essential to being able to remove the carpet stains afterward. The vacuum should be able to remove any loose dirt and debris that may be too small for you to pick up. Give some effort and reach under the seats, pedals and steering wheel. After a thorough vacuum, you should be able to get a better picture of the amount and type of stains that you would need to clean. 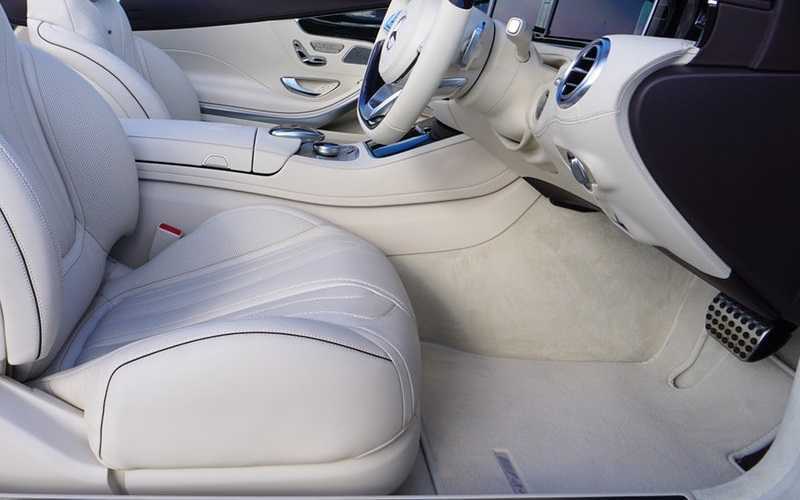 After you’ve cleaned the interior thoroughly, clean the car carpet stains. 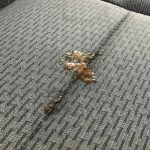 Look for the type of stains on your car carpet and prepare the needed cleaning agents that can help partially or completely remove the stains. Food and lipstick stains may require a synthetic stain remover or rubbing alcohol to initially remove the most stubborn stains. Coffee and wine spills are some of the worst carpet stains due to their acidity and deep color. You can use a mild detergent mixed with water to gently wash away the stain before you shampoo the carpet. For oil and grease stains, you can use a liquid detergent. Put a small amount on the affected area and let it rest for 5 to 10 minutes before wiping off. For organic stains like blood, vomit, and urine you may use a combination of liquid detergent for cleaning the spots and baking soda to remove the odor. Knowing how to clean car carpet stains also means knowing what shampoo to use for it. 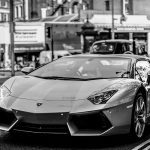 Get a car carpet shampoo from your auto detailing or car supply shop. Ordinary hair shampoo can also work but its formula is not suitable for carpets and may cause discoloration. Also, you would still need to dilute hair shampoo with water. Too much water and you can drench your carpet, too little water and the shampoo won’t be effective. Lightly spray or apply the car carpet shampoo, taking care not to put too much on the carpet since you might have difficulty wiping it out later. Read the product instructions carefully. Get a small soft-bristled cleaning brush and use circular motions to work the shampoo into the carpet. On stained areas, repeat this process several times until the stain disappears. DO NOT brush too aggressively as this can damage the carpet. Wipe away the shampoo suds with a dry rag or microfiber. You will notice that some of the dirt that are deeper into the carpet will float on the suds for easy removal. Once you are done scrubbing the carpet and wiping out the shampoo, it is time for the drying process. Get a dry towel. Press it down firmly on the carpet to absorb any liquid or moisture left. Then open all doors to air dry the carpet. If drying under sunlight, this can take a few hours. Feel around the carpet and if there are still some damp areas, leave it to dry until all traces of dampness are gone. Otherwise, you may need to learn how to clean mold out of your car, too. This is because any sort of moisture can lead to molds and mildew. Once the carpets are completely dry, we advise another round of vacuuming. The brushing and shampooing process will unhinge deep-seated dirt and debris. Remember those car floor mats that you set aside? While waiting for the carpet to dry, give those mats a thorough cleaning before placing them back in the car (here’s a quick guide with video on how to clean rubber car mats). Give the mats a good shake to remove dust and dirt. Vacuum both sides of the mats to remove any stubborn dirt. If the mat is plastic, wipe with damp rags. If the mats are made of fabric, you can apply the carpet shampoo and follow the same cleaning process that you did for the carpets. Hang the mats to dry and before placing them back in the car, give it a few more shakes just for good measure. And you are done! Easy, right? 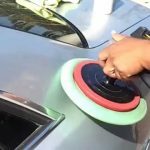 This DIY way of how to clean car carpet stains should be enough to remove most dirt stains. But for very hard-to-remove stains, it may be time to hire a professional to give your car carpets a superior clean that lasts. Consider giving your car the eco auto spa treatment by having it professionally detailed by DetailXPerts. You can expect a stain-free, clean, and fresh-smelling car carpet together with the best car wash in town. Our services are eco-friendly and mobile, specializing in steam cleaning methodology. Schedule an appointment today.